In this short series on strategy we are uncovering four hygiene conditions that need to be in place for a successful strategy. But remember: There are no guarantees in strategy. The key reason why a company is – or can be – unique is because its resource base has developed over time. This can be because of founders, initial resources, luck or innovative insights into the future. Identification of these resources by competitors has been problematic because the resources lack a clear recipe or there are non-imitable sub-ingredients. That companies are unique might seem self-evident, but for mainstream economics companies are assumed to be alike except for their size. That is why economics argues that performance is located outside the company (i.e. in the industry). And indeed, as we have seen in part 2 of this series, part of a company’s performance is located in the industry or industries it is part of. Research says it’s between 10 and 20% of the company’s performance that originates in the industry. However, a bigger part of performance – between 35 and 55% – is found within the company*. Now, next to a company being different and unique, a company’s resource base is also known to be “sticky”. This means resources cannot move freely among companies and, as such, are possible sources for longer lasting profits. After all, when a company is able to keep important resources to itself, it can make profits with these. The flip side of this stickiness is found in the fact that it often are companies with “superior” resources who are the last to change to a new radical innovation. However, when the external environment is subject to rapid change, internal resources and capabilities offer a more secure basis for strategy than industry focus. Resources are anything tangible or intangible the company can use in its processes for creating, producing, and/or offering its products or services to the market. It is what you HAVE… Capabilities, then, are what you can DO, the ability – the skills and the routines – of a company to use its available resources to a desired, intended end. 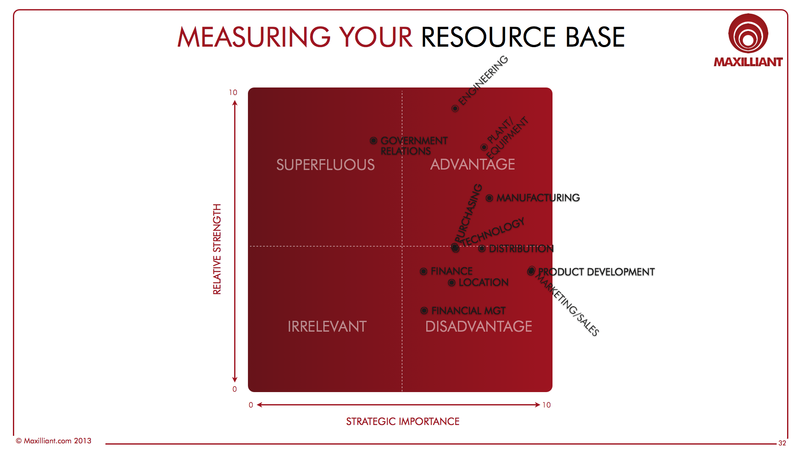 A good way to provide an objective appraisal of your current resource base is by scoring your resources and capabilities based on strategic importance and your relative strength in this area. For example, if your resources are: finance, location, technology, plant & equipment and distribution. How important are these resources in your industry and what is your performance relative to the competition. You probably want to include different stakeholders in this assessment as we tend NOT to be our own worst critic. So, your company’s resource base is what you HAVE and what you subsequently can DO with what you have. If, however, your leading resource base remains unchanged for sometime other companies can and will overtake you. That is why we distinguish a special type of capabilities, called dynamic capabilities. This refers to the capacity of your organisation to purposefully create, extend or modify your current resource base. In this context you can have technical fitness, which refers to how effectively a current resource base performs a function, but you can have lost evolutionary fitness (how effectively a resource base enables a firm to make a living). This resource base argument, as you might have recognised, is a tautology or true by logic. If you have an evolutionary fit resource base you will have a competitive advantage. Companies are successful (i.e able to make a living) because they have a competitive advantage. Always true. The key question is: How do companies develop an evolutionary fit resource base? This is the question I have wrestled with in my PhD research (in the 1990s). And, I would love to be able to give you a three step process, but it is not that simple. In 18 months of real time participative observation of top management in a steel and aluminium company combined with historical research of the 80+ years of company history I found 14 episodes of resource base “becoming”. For example, the company was founded in 1918 and became a producer of iron. I then “re-enacted” this episode of becoming a producer of iron in detail to better understand what it takes to build a resource base enabling a company to produce iron. Other examples of episodes were: becoming a producer of open-hearth steel, becoming a producer of rolled steel, etc. and much later becoming a lean, high-tech steel mill. What I found (among other things) is that the process of developing a new resource base is very much like the development of a new track to be able to reach a mountain summit. 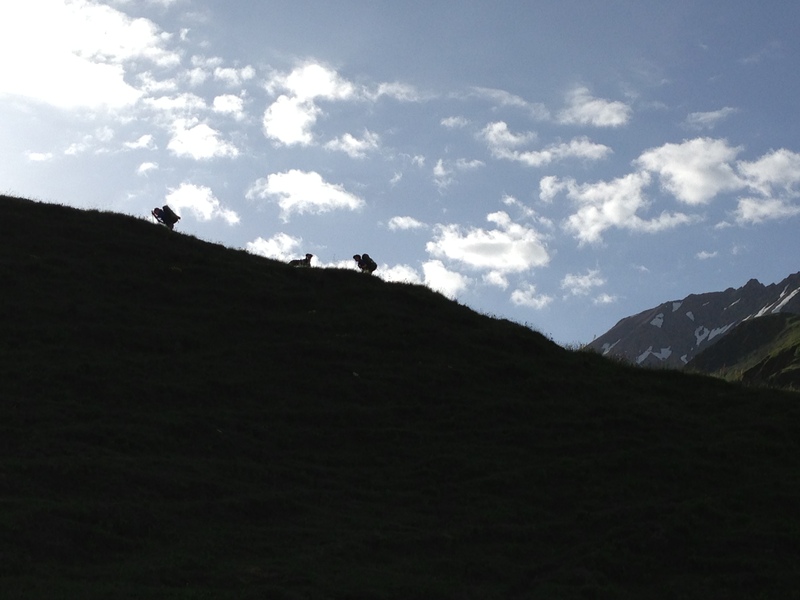 The first time someone wants to find a new path to reach the summit and takes a certain track it is hardly recognisable and sometimes even illegal. If you have an idea for how to better produce iron or to produce better iron (or a smart phone) you have to find a way that is not obvious or visible to others. Established “technically fit” understandings might help you but often hinder you in finding new ways. If you adopt the standard technique of producing iron you take an existing track. But, if you try to find a different track it takes time and slowly contours of a track emerge often through a process of trial and error. When several of these small promising tracks come together slowly a strategy path evolves, which leads to your destination and you become the new leader in producing iron. However, the key point is that a new resource base develops because of a change in (technological) commitment, because of learning, and because of repetition. This process can be very deliberate like it was with the steel company. However, it can also be somewhat accidental by accepting a very specialised building order simply because you need the revenues. This specialised building can lead to more of these types of orders and some years later you end up with an advantageous resource base. When your company is in “good repair” – staying within the path metaphor – alternative tracks and paths become less visible or represent paths to you that lead astray. This “escalating commitment” is what happens when we are successful in our business efforts and loose sight of a changing world. What are you going to do to keep an evolutionary fit resource base? * For the careful reader: yes, between 30 and 50% of performance is unexplained. Next Next post: Are You a Team-Oriented Leader or a Self-Serving Leader?